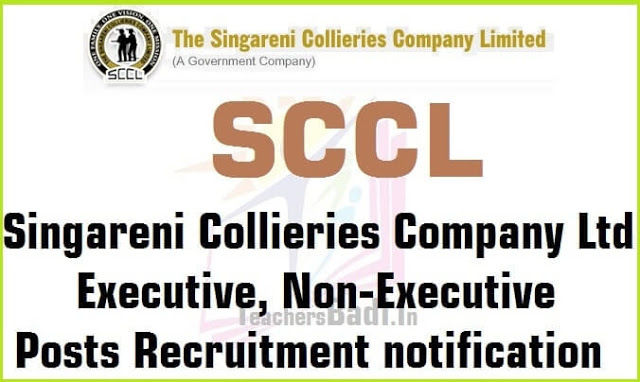 Singareni Collieries Company Ltd. Executive and Non-Executive Posts 2017 recruitment notification, sccl singareni jobs, executive, non-executive posts 2017, Executive Cadre Management Trainees Online application form, last date for apply, Exam date, Hall tickets, Results, Application fee and how to apply details given here. The Singareni Collieries Company Limited, Kothagudem Collieries has issued notification for the recruitment of Non-Executive Posts and the Company invites online applications from the eligible and interested candidates for filling up the following posts in its company. Singareni Collieries Company Limited Invites Application For Management Trainee Post (E2 Grade); Last Date October 10. The Singareni Collieries Company Limited (SCCL) has begun the application process for the recruitment of Executive Cadre Management Trainees. The Singareni Collieries Company Limited is a government company in Telangana. There are a total of 107 vacancies available only for male candidates. The vacancies are in different departments and in E2 grade. The application link will be activated on the official website for the Singareni Collieries Company Limited on September 25, 2017 at 3:00 pm. The selected candidates will be posted in Telangana state itself. Age limit: Maximum Age Limit is 30 years as on 01.09.2017.
a) Study Certificates from Class IV to X - to ascertain Local Status. b) SSC/ITS EQUIVALENT - for Proof of Date of Birth. c) All Qualifying Certificates for the post (Memo of Marks + Provisional / Original Degree). d) Latest Caste Certificate issued by the Competent Authority not earlier than six months. e) Employment Registration Card (Optional). f) I.D. Proof mentioned in the online application. g) If employed in Govt. Services, Relieving Letter from the HOD of the respective Department. h) Copy of online application data sheet. 2. SCCL Management shall not hold responsibility for any interruption of website due to technical snag. 3. The relevant Pass/Provisional/Original Certificate of the qualifying examination should have been dated on or before 01.09.2017. 4. Candidates who wish to claim reservation should invariably produce copy of Permanent Caste Certificate or the Caste Certificate recently issued by Revenue Officer not below the rank of Tahsildhar/Mandal Revenue Officer, date of issue of which should be six months earlier to 01.09.2017. 5. Any candidate is or has been found impersonating or procuring impersonation by any person or resorting to any other irregular or improper means in connection with his/her candidature for selection or obtaining support of candidature by any means, such a candidate may in addition to rendering himself/herself liable to criminal prosecution, will be debarred permanently from any exam or selection held by the SCCL. 6. Wherever percentage of marks in the qualifying examination is prescribed, the percentage is relaxed to the extent of 5% in case of SC/ST candidates only. Candidates have to apply through online mode only. Candidates need not send print application. The online application will end on October 10, 2017 at 5:00 pm. The selection procedure may involve a written test. The details of the selection procedure can be found on the official website. The application process will be available on the official website after 3:00 pm on September 25, 2017. Candidates applying for the post should first go through the detailed notification and ensure that they fulfill eligibility criteria. Closing Online submission of Application: 10-10-2017.